The Mercedes-Benz SL is a roadster manufactured by Mercedes since 1954. The designation SL derives from the German Sport Leicht, or Sport Light — and was first applied to the 300SL 'Gullwing' named also after its gullwing or upward-opening doors. It is also one of the world's safest sport vehicles. The term SL-Class refers to the marketing variations of the vehicle, including the numerous engine configurations spanning five design generations. The 300SL roadster succeeded the Gullwing in 1957. 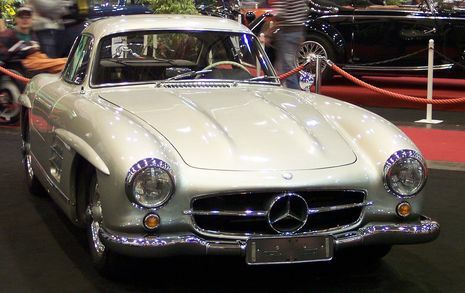 The 4-cylinder 190SL was more widely produced with 25,881 units, starting in 1955. Cars of the open SL-Class were available as a coupe with a removable hardtop or as a roadster with convertible soft top or with both tops. Production for the 190SL and 300SL ended in 1963.There is a new Mercedes called the SLS, which revives some of the styling and the gull-wing doors. Next came the SL-Class 230SL, a new design with a 2.3 six cylinder engine, low waistline and big curved greenhouse windows, and a Coupe Roadster whose distinctive roofline earned the nickname "pagoda top." Around 1968 the engine received a displacement increase and the model became known as the 250SL. The last two years of production as the 280SL saw minor changes to switch knobs, and wheel trim rings became full hubcaps. Automotive icons don't come more substantial than the Mercedes-Benz series of SL luxury roadsters. But the first SL wasn't a roadster and, despite that, it's still considered the greatest example of the breed. The SL story is really about the evolution of two ideas: The first produced a legendary coupe for both the street and track. The second has sired generations of elegant, capable and lavishly engineered open two-seaters. Each generation of the SL has been exceptionally long-lived. Over more than half a century, there have only been five full-size SLs and two smaller "near" SLs (the 190SL of the late '50s and early '60s and the current SLK). That means an average SL stays in production for a full decade. Daimler-Benz recovered rapidly from the devastation of World War II and was producing Mercedes cars again by 1946 — albeit a virtually unchanged version of the 1942 model 170 sedan. Before the war, the company had considered racing (and winning) a critical part of both its engineering development and public image, and there was no reason for that to change after the war. By the early '50s, Mercedes was ready to reenter motorsports. It looked at immediately going into Grand Prix racing, but on June 15, 1951, the Board of Management ultimately decided its initial efforts should be aimed at winning the 24 Hours of Le Mans. Less than a year later, in March 1952, the company showed the prototype for the sports car built to do that, the 300SL Coupe. This first 300SL was built around a tubular space frame chassis and was powered by a version of the 3.0-liter, SOHC straight six that had been developed for the then-new 300S sedan, formal coupe and convertible. In the 300SL, everything was optimized for performance. The 175-horsepower high-compression engine was tilted 45 degrees toward the passenger side to lower the cowl and hood, the suspension was independent both front and rear (though the rear used rather diabolical swing axles), and the aerodynamically efficient skin was made of aluminum. However, because the space frame's design depended on interlacing small tubing running high along the car's sides for strength, conventional doors were impossible on the 300SL racecar. Faced with that quandary, Mercedes engineers set about finding a new way for drivers to enter and exit their developing sports car. What they came up with were doors cut deep into the roof and hinged at their top, so that they swung up to open. And when open, they resembled the wings of a seagull. Naturally, the doors quickly picked up the popular nickname "gullwing" doors and soon after that, so did the car itself. On that first racing prototype, the doors didn't extend down much beyond the side windows so getting in or out took real gymnastic ability. Plus, no one ever really explained how they'd get out of a 300SL should it wind up on its roof after a crash. But no matter, the car was a sensation. It was the first truly modern post-war sports car whose sleek lines had a negligible coefficient of drag; the suspension was advanced, and there was just 1,930 pounds spread over its 94.5-inch wheelbase and 166-inch overall length. In May, the 300SL made its competition debut at the 1952 Mille Miglia, the epic 1,000-mile open road race that ran the length of Italy. Three 300SLs entered the race, but the winner was a Ferrari 250S. It would be one of the few times the 300SL didn't win that year. In June, 300SLs came home both first and second at Le Mans accomplishing the goal set out for the car. Then they won at the Nurburgring, and again at Mexico's Carrera Panamericana road race. The 300SL Coupe race machine was all that it was supposed to be and more. So there was nothing left for it to do, and after 1952, Mercedes abandoned sports car racing to concentrate on Grand Prix events with the astounding single-seat, eight-cylinder W196. With its racing legend secured, the 300SL could have faded away. But Mercedes' U.S. importer, Max Hoffman, thought there would be a market in North America for a road-going version of the car. On the strength of Hoffman's passion, and his order for 1,000 300SLs, Mercedes began developing the production machine. And at the 1954 New York Auto Show, the production version of the 300SL was shown for the first time. Sharing its distinctive profile and signature door design with the racecar, it was impossible to mistake the road-going coupe for anything but a 300SL. But in fact the road car was much more civilized and, in many ways, more ambitious than the racer. With its slab sides and austere decoration the racecar wasn't suitably ornate for a 1950s road machine — even for a Mercedes. So the body was redesigned with cooling vents, chrome trim, a bold three-pointed star in its grille, "eyebrow" protrusions over each wheel well and larger, deeper cut gullwing doors that allowed easier ingress and egress and also had small wing windows for at least some ventilation. Also instead of being built of aluminum, most of the road 300SL's body was steel with an aluminum hood, doors and trunk lid (29 all-aluminum road-going 300SLs would be built after 1956). Carrying over more or less intact from the racecar were the tubular space frame, the independent suspension and the huge ventilated drum brakes. But while the engine was still based on the 3.0-liter, SOHC straight six from the 300S sedan (and still sat at a 45-degree angle under the hood), it now sported a groundbreaking gasoline direct injection system. The injectors were mounted in the upper part of the cylinder wall where the spark plugs would be in a standard 300 engine, and the spark plugs were in turn moved to the side of the cylinder head. Add in a high (for the time) 8.55-to-1 compression ratio and a dizzying (for the time) 6,600-rpm redline and the result was a thrilling 215 horsepower at 5,800 rpm. Keeping in mind that the same engine (with less compression, a milder cam and carburetors) was making just 115 horsepower in Mercedes' 300 sedans, and the accomplishment of the SL's engine becomes obvious. Luxury equipment like sound-deadening leather upholstery and fitted luggage bounced the '54 300SL's weight up past 2,700 pounds and its price to a lofty $11,000 — nearly twice what GM was asking for its most expensive car that year, the $5,875 Cadillac Eldorado. The 300SL was one of the best sports cars of its era. Stirring the all-synchromesh four-speed gearbox, Britain's Motor Sport magazine had the 300SL coupe zipping to 70 mph in just 8.5 seconds and attaining a studly 146-mph top speed. "The effect is electrifying," wrote Autocar about the car's acceleration. Motor Trend's test had the 300SL hitting 60 mph in 8.5 seconds and the quarter-mile flashing by in 16.1 ticks of the clock. Quick though the 300SL was, it would be a mistake to call it easy or forgiving. With its swingarm rear suspension, the change in rear tire camber could be quite extreme, leading to a sudden onset of oversteer. But in the hands of an expert, that trait could be managed. As production of the 300SL ramped up, Mercedes was able to cut the price so that in 1955 it could be had for less than $7,500. But even at that "low" price, the coupe's appeal was limited by its rather tough-to-overcome tall and wide door sills, limited luggage space and notoriously toasty interior (air conditioning was not an option). If the SL were to go forward, Mercedes knew it would have to produce one tamed for the gentlemen with means who shopped Mercedes. 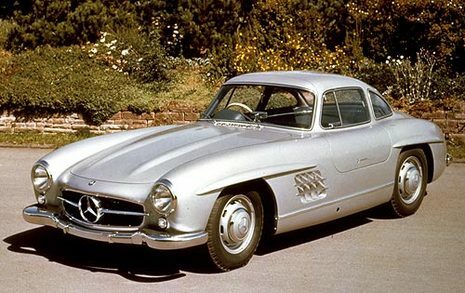 So after building 1,400 Gullwings, Mercedes replaced the coupe with a new, more civilized open roadster for the 1958 model year (production actually began in the summer of 1957). By the way, "SL" originally stood for "Sporty" and "Light." The original coupe will always be the sportiest SL and the last one that could accurately be described as light. Though destined to always be overshadowed by its charismatic Gullwing brother, the 1958 300SL roadster was in many ways the first true SL as we know it today. Built atop the same basic frame, using the same basic drivetrain and having a body similar to the coupe, the roadster nonetheless projected its own aura of dignity, elegance and power. To build the roadster, Mercedes strengthened the center tunnel portion of the chassis and the sides were revised to allow the fitment of conventional doors. The rear suspension was tamed somewhat by moving the pivot points for the swing axles lower in the chassis and by adding a supplementary spring mounted transversely above the differential and linked to the axles via vertical struts. Also improving the handling were wider front and rear tracks and wider tires. The roadster also benefited from engine refinements, including a new camshaft and a higher (9.5 to 1) compression ratio, that bumped output to 235 horsepower. But it also weighed over 200 pounds more than the coupe, which meant performance was virtually identical. From the outside, the most readily apparent differences between the coupe and roadster (besides the obvious decapitation) were the adoption of a wraparound-style windshield and new bezels that grouped the headlights, side marker lights and turn signals into a single, very attractive unit. Less obvious was the incorporation of a real, usable trunk. In 1961, the 300SL also got four-wheel Dunlop disc brakes for the first time. It was a far more civilized car than the Gullwing, but sales were less than spectacular. With prices in 1958 once again hovering at nearly $11,000, that's hardly surprising. Offered with both a soft retracting roof and a bolt-on hardtop, the 300SL set the standard by which all future SL roadsters would be judged. But even though Mercedes built more roadsters (a total of 1,858) than Gullwing coupes, they would never match the former car's iconic status. A mainstay of the Mercedes-Benz lineup for more than 50 years, the SL-Class of high-performance coupes and roadsters has gained an international reputation among driving enthusiasts and collectors, thanks to sporty styling and powerful engines, as well as the exclusiveness of the Class. Many of the early SLs remain highly coveted today - and highly expensive. Those descriptions apply to current SLs as well. Like the high-end S-Class sedans, the SL-Class two-seat coupes and roadsters have always come equipped with Mercedes' latest technical innovations and luxury appointments, dressed up in tasteful yet cutting-edge design. The early 300SLs with gull-wing doors, first offered in 1954, set the standard for the SL-Class, and Mercedes has never looked back. SL roadsters with either hardtops or soft tops debuted in the late 1950s, setting off a successful run through the decades during which the automaker has replaced the 4- and 6-cylinder engines of the early SLs with V8 and V12 engines. During that time, the design of the SL-Class has been evolutionary rather than revolutionary, as Mercedes sculpted and smoothed the SL's lines for aerodynamics as well as aesthetics. Prior to 1994, Mercedes used a naming system that led with a car's engine size (300, for instance, indicated a 3.0-liter engine) followed by the SL designation, which refers to Sport Light, or Sport Leicht in German. Starting with the 1994 model year, Mercedes reversed the naming system, leading with the SL designation and establishing the SL-Class as we know it today. Mercedes made the change to more accurately reflect engine size and eliminate confusion. However, the basic elements of the naming system remain, so the SL320, introduced in 1994, took its name from its 3.2-liter, six-cylinder engine. Today, the SL-Class consists of four very desirable models. The SL550 Roadster holds the entry-level slot in the lineup, with a V8 engine that pumps out a mere 382 horsepower. That's trumped by the SL600 Roadster, with a throaty 510-horsepower V12 engine packed under its stylish hood. Both trims come equipped with a retractable aluminum hardtop that drops in a matter of seconds for open-air driving. Inside, both feature hand-polished wood trim and leather upholstery. The big boys on the block, however, are the SL55 AMG and SL65 AMG, with body lines and engine tuning courtesy of AMG, Mercedes' in-house sport tuner. The SL55 comes with a supercharged 510-horsepower V8, while the SL65 takes top performance honors thanks to its bi-turbo V12, which produces an astonishing 604 horsepower. Like all SLs over the past five decades, it mixes luxury, high performance, and sport driving of the highest levels.